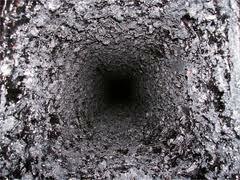 Importance of Chimney Cleaning – Avoid the “Wrong” Kind of Fires! Keeping chimneys clean is a big key in preventing chimney fires. If you don’t use your fireplace very often, or you just moved, you might not know whether your chimney is actually clean or not. This is vital to a properly working fireplace and chimney, as well as to your safety. A black damper. Since it sits right above the firebox, the damper is often the easiest thing to see and reach. And it gets caked with creosote. Look or reach inside, and see what you can find. If you see black gunk or you can pull out chunks of the stuff, there’s a good amount of creosote buildup inside. This is not safe to have around. 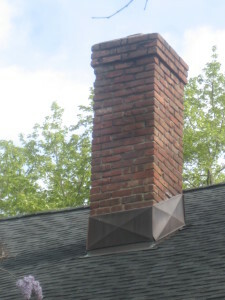 How often your chimney needs to be cleaned depends a great deal on how much you use it. The kinds of fires you build and the type of wood you use also have an effect. As a rule of thumb, it’s a good idea to have chimneys cleaned at least once a year, usually before cold weather sets in. Some people prefer to do it in the spring, but scheduling a fall cleaning will also clear out anything that might have fallen into the chimney during the summer. Most people hire certified chimney sweeps. It’s dirty work, and not something that’s okay to do half-way. A certified, well-trained sweep will do a better job in a shorter amount of time than you can. Look for someone who is credentialed by the Chimney Safety Institute of America. Ladder for climbing onto the roof. Drop cloth or old sheet to cover fireplace opening, and additional drop cloths or sheets to cover any rugs or furniture in the area. Duct tape or another product for attaching the drop cloth or sheet to the fireplace opening. Vacuum cleaner with crevice attachment. If you plan on making chimney cleaning a regular habit, you might want to think about investing in a vacuum designed for exactly this. Chimney rod and brushes. You can buy these at some hardware and home stores, or from a chimney sweep supplier. Some fire departments keep brushes and rods for people to borrow to clean their chimneys. Stiff-bristled cleaning brush – one with a long handle for easier access to the damper. Broom for sweeping up ash and other debris. Eye protection, gloves, and a dust mask. While you can get away with a cloth mask, a respirator mask is strongly recommended. You don’t want to inhale creosote dust or soot. Old clothes. Wear things you won’t mind getting dirty. Flashlight, for checking your work. But let’s be honest… do you REALLY want to do that all by yourself, and not know for sure if everything is conducted properly?